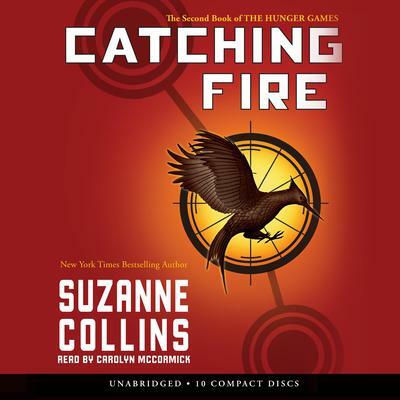 Suzanne Collins continues the amazing story of Katniss Everdeen in the phenomenal Hunger Games trilogy.FORMAT: 9 CDs, UnabridgedNARRATOR: Carolyn McCormickAgainst all odds, Katniss Everdeen has won the annual Hunger Games with fellow district tribute Peeta Mellark. But it was a victory won by defiance of the Capitol and their harsh rules. Katniss and Peeta should be happy. After all, they have just won for themselves and their families a life of safety and plenty. But there are rumors of rebellion among the subjects, and Katniss and Peeta, to their horror, are the faces of that rebellion. The Capitol is angry. The Capitol wants revenge. Fantastic- better than the first! This is a great book with a very good narrator. I liked her voice and she did a pretty good job with the inflections for other characters. Though not as good as the first in the series, this second book in the trilogy has enough action to keep the pages flying. I liked Katniss even less in this book, but if you ignore her annoying lack of personality and all her weird inner emotional drama (if it can be called “emotional,” since I’m not entirely convinced she has emotions), then this is a great book. I still wish they had picked a different narrator, but I do recommend this book. I certainly give Ms. Collins kudos for her imagination and storytelling abilities.